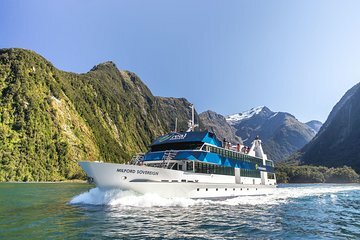 Explore the spectacular beauty of the Milford Sound on a 1.5-hour cruise that takes you to the mouth of the fiord. Ride on a spacious modern vessel with unobstructed views from large viewing windows and the open deck, and hear live commentary from the captain about points of interest including Mitre Peak and Pembroke Glacier. Round-trip transfers are available from Milford Sound, Te Anau, or Queenstown.